Wandering through the Museo del Prado in Madrid, 30 years ago, my eye was caught by a painting by Alonso Cano. This canvas from around 1650 was hanging in a room amidst famous contemporaries from the Baroque era. At first sight the scene struck me as quite odd, though I did understand that there was no need to doubt the pious intentions of the artist. Only later I discovered that there are comparable depictions from earlier centuries. The remarkable feature of Cano’s version is, however, its striking realism. The Spanish titles ‘Premio lácteo a San Bernardo’ and ‘La Virgen de la Leche,’ something like ‘Saint Bernard is Rewarded with the Milk of the Virgin,’ only reinforce this. What did the Capuchin monks of Toledo, in whose convent the work was hanging, make of this and what did the person think who commissioned the work, who is looking on from the bottom left of the work? That they admired this traditional scene with devotion is beyond question. In his own time Bernard of Clairvaux was considered an especially devoted worshiper of the Mother of God. To him her com-passion under the cross with her son made her a co-saviour, a title the Roman Catholic church is still reluctant to ascribe to Mary by dogma. The story goes that the sweet-voiced doctor of Clairvaux had to preach about her qualities and that the milk of the Virgin symbolises the inspiration he needed for this. Another story supposes the virginal milk to be a sign of gratitude, a reward for services rendered. The rendition by Alonso Cano differs from earlier and other versions that show Mary and Bernard in an indistinct space with an almost invisible jet of milk, in a Gothic church with a miniscule lion as a witness, or Mary located in a celestial vault and Bernard catching the milk in his hand. However, in Cano’s portrayal we find ourselves in a concrete room with a real person as a witness, namely Cardinal Sandoval y Rojas. The Christ Child, slightly bent forward, looks down on the milk that connects his mother and the saint. The round window in the right upper corner reinforces the realism of the scene. Behind it pines are visible and a building that could be a convent. The symbolism of the scene may be beyond dispute, its astonishing feature is its lifelikeness. Bernard of Clairvaux was hardly a softy. Founder, counsellor of kings, thinkers and other prominent people, propagandist of the Second Crusade, willing to confront the established theology as well as the heretics of his time. He was stern and reticent, contemplative, a teacher specialised in the doctrine of Mary. Especially Mary’s role of mediation was of highest concern to him, the Mother as link between humans and their Creator. That Mary nurses her child Jesus is a scene that is depicted more often. One of these can be seen in Saint Augustine, FL, USA. The sanctuary of Our Lady of the Milk is the oldest in the north of the New World, founded in 1565 on August 28, the feast day of the holy church father from Hippo. Here the first mass was celebrated in what later would be called the United States. Already at the beginning of the 16th century the Spaniards ‘discovered’ La Florida, where according to the explorers and visionaries the long sought source of Eternal Youth was located. 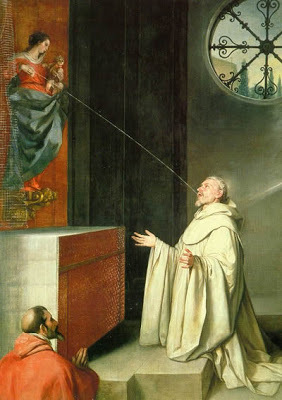 The connection that was made between the mother’s milk of the Virgin and that source out of which all people desire to drink, makes Bernard into an envied precursor. Today all that is available to ordinary believers are bottles of water from the Fountain of Youth in the sanctuary of Our Beloved Lady of the Milk. Alonso Cano: Saint Bernard and the Virgin, ca 1656, oil on canvas, 267 x 185 cm, Museo del Prado, Madrid. Alonso Cano (1601-1667) was a valued painter at the court of king Philip IV and a contemporary and colleague of Diego Velázquez (1599 –1660). Robert Lemm specializes in Spanish and Latin-American literature and history. He is a writer and translator, winning the Dutch Martinus Nijhoff Prize in 1979. His books deal with religious and philosophical subjects, his most recent ones are about Mary, Pope Benedict XVI and the rise of Eurabia, and the history of Spain.